A long time ago I read a sweet little book about how to be happy that suggested you should lick your plates clean after every meal rather than bothering to wash up in the usual way. It seemed to work for her, not that I ever tried it. The idea of licking your plate clean to be happy is a very sound and true principle, however. Draining the last drop out of every fabulous experience is something we could all do a little more often. I thought of this today when I was playing with my new puppy Dixie. Dixie has been in my home a whole two days. She generally grins from long fluffy ear to long fluffy ear with her tongue hanging out. Her main signal of having trouble adapting is a tendency to avoid eating, but then again I’m also the sort who will have challenges getting food down when I’m a little nervous so what can I say about that? In my concern for Dixie’s nutritional well-being, I decided this afternoon that since she was ignoring her recommended puppy food I would supplement with a little goat Gouda. I offered a tiny piece, and then another tiny piece, vastly increasing my popularity. I stepped away from the table and sat down on the floor of my wooden porch (so as not to encourage bad table manners) and held a half-eaten rib for Dixie to gnaw on. 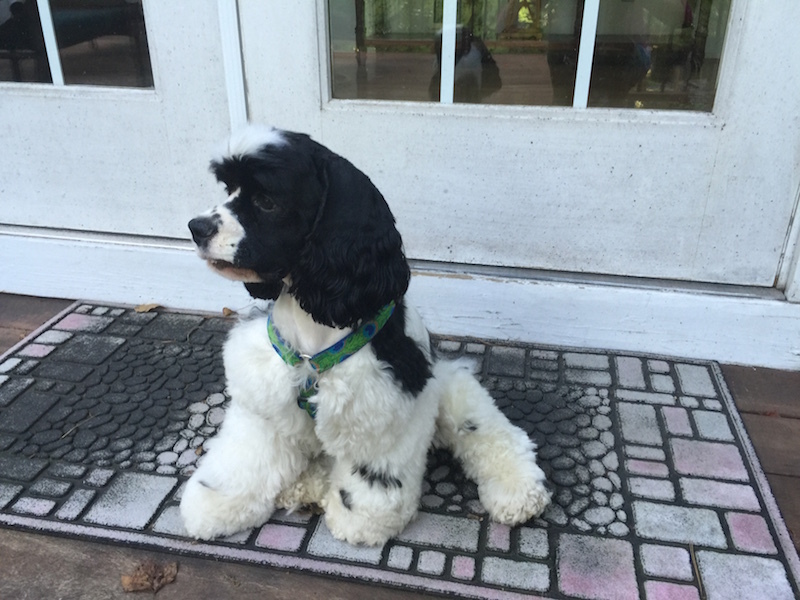 My popularity as a new puppy owner was growing by leaps and bounds. Recognizing I was onto something, I used a little leftover barbecue to encourage sitting. Dixie would sit, eat a tidbit of barbecue, then get up so I could tell her to sit all over again and then be bestowed with another morsel of barbecue. After finishing my meal I decided to indulge in three gluten-free sugar cookies. As Dixie was finally sitting in her basket after jumping out and having me redeposit her fluffy self about five times, I wanted to reward good behavior so when I was done with my cookies I held out my dessert plate for her to lick. She did not know what to do! Clearly she had never licked a plate in her life. Having grown up the puppy of serious dog breeders who coached her to not just one but three AKC championships, winning beauty pageants in Georgia, South Carolina and Maryland, apparently dog beauty queens aren’t trained to lick the plates. In only two days in her new home I was already encouraging fun behavior that hopefully will not lead my new dog to ruin. 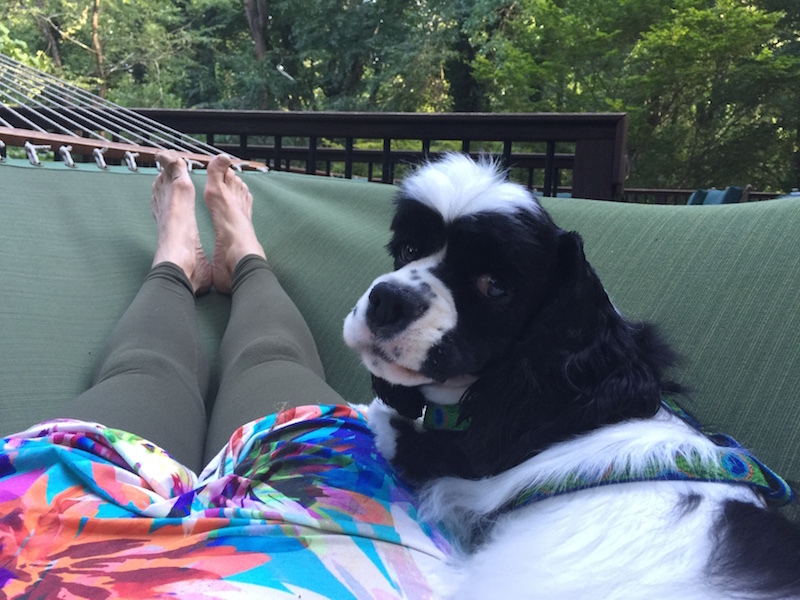 After dinner, Dixie lept into the hammock so we could snuggle up before I left to teach yoga class. For this behavior, she did not need to be trained. Surely fluffiness and hugs had been following her all of her days. It’s my lot in life now to teach her how to lick the plate. Together as owner and puppy happiness and mirth will be sure to follow.